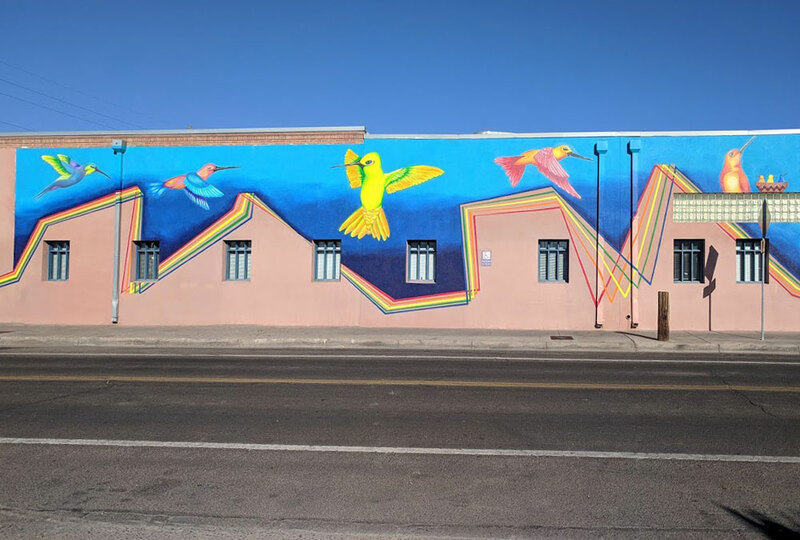 This mural was a public/private non-profit partnership in collaboration with UNM College of Fine Arts, Albuquerque Healthcare for the Homeless / Art Street, CABQ 1% for Art Program, and Working Classroom, with lead Albuquerque artist/mentor, Nani Chacon. The UNM CFA 2017 Fall “History of Mural Painting” class developed the final mural design with input and participation of the Art Street clients. Several mural designs were developed as a class project and were pitched to the City of Albuquerque's Public Art Program and AHCH. The fall mural class, taught by Dr. Kymberly Pinder, dean of UNM's College of Fine Arts, and muralist Nani Chacon focused on the history of murals, from cave painting to graffiti, while concurrently developing a mural for AHCH. Students not only learned about the history of murals, but also about the necessary steps involved in producing and commissioning them. They learned that this year was the 50th anniversary of the Wall of Respect mural in Chicago, which started a movement of inclusion of marginalized communities through public art. The mural at AHCH, celebrates that powerful tradition. The selected design by Nathaniel Nez, To Spread Happiness, features hummingbirds, which symbolize determination, flexibility and adaptability. The hummingbirds flutter across a turquoise sky above the Sandia skyline outlined in rainbow stripes. The class, along with Chacon, Art Street participants, and Working Classroom artists Adriana Ortiz and Angel Pavia, worked on bringing Nez's design to life. Nathan Nez is a Navajo artist, veteran, and a family man from Woodsprings, AZ, who uses different media and substrates to portray both graphic and Diné imagery through his unique street style. Growing up, he had no knowledge of art and its history until going to the University of New Mexico. It was there that he learned many artistic styles such as classical, modernism and post modernism. He has learned to express his art in a myriad of mediums such as oil, acrylic, spray paint, gold leaf, wood burning, and mixed media and enjoys exploring different forms of substrates such as wood, metal, stretch cloth, and Plexiglas.